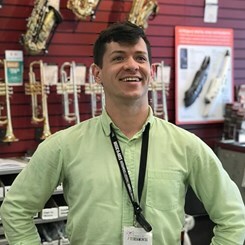 Hello, I am Joey, and I am excited to be leading the team at the Timonium Music and Arts. Music is one of the most important things in my life, and I love what I do. Every day, I get to see kids come into our store and leave musicians. It makes me very proud to know that I was able to help them along in their journey. Helping local musicians and music teachers is very rewarding. Music and Arts has been like a second home to me over the years, from loitering and playing with guitars as a teenager to managing the Timonium location and everything in-between. Now, I'm looking forward to inviting you into my home!